I enjoy traveling and reading. If I can combine the two, even better. Life would be unlivable without the internet, a nice pair of jeans and a loved one. Anywhere warm with plenty of sunshine. My natural state is night owl but due to my job I have forced myself to be an early bird which includes an earlier bedtime. Adam’s first introduction to ashtanga yoga was in 1998, with Madonna on the Rosie O'Donnell show. He quickly sought more info on this practice. But it wasn't until the mid 2000's that he would incorporate a consistent daily practice into his life. Wanting to pursue his passion, Adam sought out senior teachers who shared his love for studying the physical, mental and subtle aspects of yoga. 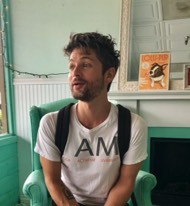 Over the years he has completed teacher trainings in Jivamukti, power yoga/vinyasa and in the ashtanga method; including first, second and third series, with Tim Miller at Ashtanga Yoga Center, Encinitas, California. As a former professional athlete, his classes incorporate modern biomechanics and knowledge of the body, into the more traditional practice of asana.